Ok, so, if you're one of my regular readers, you know I always see recipes on TV or social media and then I tuck them away until I get around to posting them. This is one of those posts! I saw this, (on FB, I think) and then I made them for a little get together. Great! Awesome! Delicious! Love 'em! Took the picture to save it until posting, perfect. But here's the thing... I have no idea what recipe I used! I specifically remember that the recipe called for brushing the tops with pizza sauce before baking (as you can see in the photo), but I can't seem to find that video anywhere. Ah well. What can ya do??? So here's the deal. I'm gonna use the picture from when I made them, but I'm gonna share a different version, fair enough? This recipe is from a Tasty video, and it's pretty much the same thing I did, only they're brushed with seasoned garlic butter instead of pizza sauce. Works for me!! Either way, they're amazing and fabulous and they're perfect for Super Bowl parties or tailgating or just anytime you have a few friends over. And btw, you might consider making a double batch. They seem to disappear quickly! Cut each biscuit in half. Press each half into a circle with your thumb. Place a small dollop of pizza sauce, 1 pepperoni, and 1 cube of mozzarella on each biscuit round. Bring the edges up and over, pressing them together and being sure to leave no gaps for the filling to leak out. Lay the pizza bombs on a baking sheet lined with greased parchment paper. Combine melted butter, garlic, salt and pepper, and Italian seasoning in a small bowl. Brush the butter mixture onto each pizza bomb and top with Parmesan. Bake at 375 for 15-20 minutes (until biscuits have nicely browned). Once pizza bombs are cool enough to handle, serve immediately. There are as many variations as there are pizza toppings. Not a fan of pepperoni? Choose a different topping! Just cook whatever toppings you choose before you put them into the center of the biscuit dough. My favorites are mushrooms, bacon, peppers, and onions. Saute them in a skillet, drain them of any excess fat, then proceed as directed. The thing to remember is not to overfill them. Just be sure you're able to close the dough around everything, and they'll turn out fine! Btw, if you want to brush them just as I did with pizza sauce instead of garlic butter, go for it! Oh, and one other thing.. to turn regular marinara sauce into pizza sauce, just add oregano!! During the winter months, I always find myself wanting something that's warm and cozy. Since casseroles always seem to hit the spot, it's not uncommon for me to just see what ingredients I happen to have on hand, and then throw them together. As long as you have a few basic components, it will work! Basically, if you have a creamy sauce, a protein, some veggies, and a topping, you have the makings of a fabulous casserole. I always find it's easiest if everything is already cooked before you assemble it, then it all comes together when you bake it. Yes, I guess you could put in raw potatoes etc, but they always seem to take far too long to cook in the casserole. It's easiest to just use up some leftover potatoes or just boil or microwave a few before you put it all together. Know what I mean? I've listed MANY variations following the recipe, so just see what you have in the fridge, and then run with it! This is usually how I cook. A little of this, a little of that, use up the leftovers, use what you have on hand. It's how my Mom always cooked and it's how I learned. BAKING is a completely different story. When I'm baking, it's always measure everything and follow the recipe. But when it comes to casseroles, you can improvise all you want! So have fun, season as you go, taste as you go. Like I said, just be sure to hit all the main points and it'll be fabulous! I promise!! In a large skillet, saute onions in a little butter or oil until softened. While they're cooking, peel and slice your carrots, then add them to the pan along with the garlic. Saute for a few minutes more. (You're not cooking the carrots all the way through, but you're just getting them started). Remove to a large mixing bowl along with the peas. Set aside. In the same pan, add butter. When the butter melts, add flour. Whisk to make a paste. Cook for a couple minutes, then add milk, thyme leaves, salt, and pepper. Continue to whisk until it thickens. While the sauce is cooking, pull the chicken to shreds and dice the potatoes. Add to your bowl of cooked veggies. When sauce is thickened, add it to your mixing bowl and toss everything until coated. Adjust seasoning, if needed. Pour everything into a sprayed casserole dish. Cover with foil and bake for 30-40 minutes or until bubbly. Remove foil, top with lots and lots of French fried onion rings, then place back in the oven for an additional 10 minutes. Remove from oven and let it sit for a good 10 minutes before serving. Yes, yes, I know there's no cheese in the recipe. Some might even say "what is a casserole without cheese?" So if you'd like to add cheese, GO FOR IT! Any kind you like. Just add a few handfuls of shredded cheese when you toss everything together. ok, so lets talk about variations. Wanna add bacon? Great! Just saute it first, then cook your onions in the bacon fat instead of butter. Not a fan of chicken? How about diced ham instead? or brown and drain some ground beef or turkey! Wanna make it vegetarian? Add more veggies and leave out the meat! You could do broccoli, asparagus, cauliflower, or some sauteed fresh or frozen spinach. Anything you like! Wanna make it a seafood casserole? Add some cooked and peeled shrimp or imitation crab. Add a little old bay seasoning to it too. You could even do a can of Albacore tuna. Don't have any potatoes? Add some cooked macaroni or egg noodles or rice instead! Don't have French fried onion rings? Add a couple tablespoons of melted butter to some bread crumbs and then sprinkle them over the top. Could also add some Parmesan cheese too. That always makes a lovely gratin topping. Want some heat? Turn it up! Add some crushed red pepper flakes or diced chilis. You could also just serve it with Sriracha or Tabasco sauce on the side so everyone can add as much or as little as they prefer. Looking for some extra flavor? Add a splash or two of white wine to your cream sauce! Add fresh herbs! Add fresh basil or oregano. Or how about some fresh rosemary or parsley? They always add a burst of freshness that you just can't get from a frozen casserole. The variations are endless. just remember, as long as you hit all the main components, it will work! OK, ok, I know everyone has New Year's resolutions, and many are to lose weight or at least to start eating better, cutting out the junk, going on a diet, etc. Am I right? Well before you do that, I think you should make these bars!!! Otherwise you'll be missing out! They are ABSOLUTELY NOT something you want if you're on a diet, but OMG they taste amazing. I'm not even sure where I found the recipe. Someone probably posted it on Facebook, and I've seen it on several cooking blogs. I think it's from a blog called Cookies and Cups. It's got my name written all over it! I seriously have yet to meet a salted caramel anything that I didn't love. And these are now right at the top of my list. They're very similar in technique to the favorite Chocolate Chip Caramel Brownies. You make one dough for the top and the bottom, then you melt caramels for the filling. Easy! I made them for the cast and crew of the show I'm rehearsing and everyone LOVED them! (Sometimes you just need a little treat to help you through a 10 hour rehearsal!) So whether you're rehearsing for a show, throwing a party, or just craving a yummy sweet and salty treat, you should whip up a batch! In a large bowl, combine the butter and sugars. Using mixer on medium speed, beat together until creamy. Add the vanilla and beat until combined. Sift the flour into the butter mixture and beat on low speed until a smooth soft dough forms. Spray a 9x13" baking pan lightly with non-stick cooking spray. Press one-third of the dough evenly into the pan to form a bottom crust. Wrap remaining dough in plastic wrap and chill in refrigerator. Bake crust until firm and the edges are a pale golden brown approx 20 minutes. Transfer pan to a wire rack and let cool about 15 minutes. While the bottom crust is baking and the remaining dough is chilling, make the caramel filling. Place the unwrapped caramels in a microwave-safe bowl. Add the cream. Microwave on high for 1 minute. Remove from the microwave and stir until smooth. If caramels are not completely melted, microwave on high for 30-second intervals, stirring after each interval, until smooth. Once the caramel is melted add in your 1/2 tsp vanilla and stir until combined. Pour the caramel filling over the crust. If you are going to salt the caramel sprinkle it on caramel layer now. Remove the remaining chilled dough from the refrigerator and crumble it evenly over the caramel. Return the pan to the oven and bake until the filling is bubbly and the crumbled shortbread topping is firm and lightly golden, about 25 - 30 minutes. Let cool before cutting into squares. As I do with all bars baked in a 9x13 pan, line the baking pan with parchment paper and let it hang over the sides. Then you can use the paper as a sling to lift the entire batch out of the chilled pan before using a big sharp knife to cut into perfect squares. Yes, yes, I know that's a crazy amount of butter. Let's just embrace it and move on, shall we? You're not going to eat them every day, right? And you're probably not going to eat the whole pan, right? So, you're fine!! Since I like a extra salt with the sweet, I sprinkled a little extra sea salt over the baked bars as I took them out of the oven. You do you! If you'd like to bake them in a half sheet pan, simply increase the ingredient amounts by half. I'm thinking this same recipe can be used with other fillings, yes? What do you think? Maybe a raspberry jam? Or blueberry jam and a little lemon or orange zest? Or some sweet orange marmalade? Or how about peanut butter? That would definitely be a good thing with some chopped roasted salty peanuts on top! Yum. Ok, so lets talk about comfort food. You have your mac n cheese or lasagna or some other favorite pasta... You have your pizza and your deep fried EVERYTHING... You have your casseroles or your burgers... I love ALL of them. But for me, the one thing that will always be highest on the comfort foodometer is POTATOES! Any kind, any color, and every way you can possibly think of cooking them, potatoes are my go-to comfort food. I'm not even kidding. French fries are totally my undoing. I've literally never met a potato I didn't like. Now, add cheese and bacon and cook them in a slow cooker! BOOM. You've taken a simple potato and elevated it to something AMAZING. It's seriously the definition of comfort food, especially when you want something hearty to fill you up on a cold day. I first saw this recipe in a Delish video, and immediately added it to my Must List. I was originally going to make it as a side dish for a ham dinner, but then realized it goes GREAT as a breakfast or brunch side dish too!! Serve 'em up with a fried egg on top and it's heaven on a plate! It's the perfect thing if you want to free up some oven space, or if you'd like to avoid turning on the oven altogether! It's also convenient because you can assemble it ahead of time. It's so good, you could even have it as a main dish! If you don't own a slow cooker, this is definitely a good reason to buy one! Line a slow cooker with foil and spray with cooking spray. Add half the potatoes, 1 1/4 cups cheese, half the garlic, 1/3 of the cooked bacon, half the green onions, and half the paprika. Season with salt and pepper. Repeat. Cover and cook on high until potatoes are tender, 5 to 6 hours. (The bigger your potatoes, the longer they'll need.) About 20 to 30 minutes before serving, top with remaining cheese and bacon (this is your moment to make the potatoes look pretty!) Garnish with more green onions, drizzle with sour cream, and serve. Ok, I know this is where I usually talk about everything I'd do to tweak the recipe or vary it in some way, but honestly, this recipe is just perfect the way it is! The only thing I'd say is.. just like Mom always said.. if you like a lot of something, add a lot! Want more cheese or maybe a different kind? How 'bout some more bacon? Are you a pepper monkey? Add as much as you want! Actually, come to think of it, I think I might add more scallions next time, and maybe a little less garlic. TBH, I didn't even measure. I just kinda threw everything in. You do you! 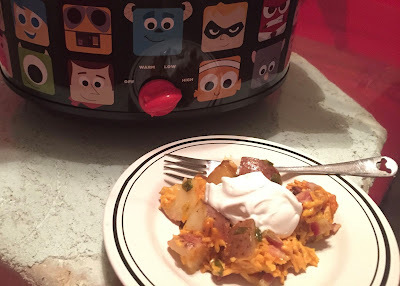 oh, and one other thing.. yes, my Pixar slow cooker is the envy of all who see it! !